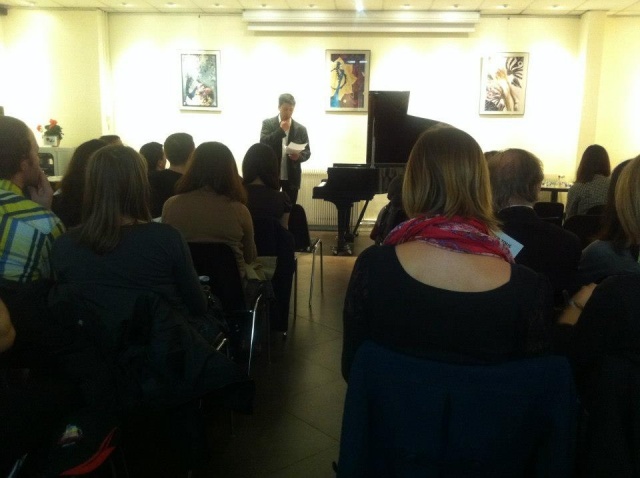 A piano recital by Ms Misuzu Tsuji was held at 7pm on Friday 19th October. The opening address was given by Mr Christophe Kurita. He performed a presentation of the “Home for all” project and said “Now is the time to remind ourselves about the disaster which happened a year and a half ago. I hope this event will give us an opportunity to do so”. The Recital started with “Pavane pour une Infante Défunte” by Maurice Ravel then pieces by Toru Takemitsu and Frédéric Chopin were followed. These melodies touched and cherished each one of our hearts which were filled with thoughts for Japan. 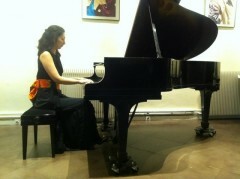 For the encore, Chopin’s “Nocturne” (a posthumous work) was played. People made silent prayers while being filled with a melody with seemed to be reaching out for hope again and again in the midst of a crisis. After the recital, an exhibition by a cartoonist, Mr Christophe Kurita, an illustrator, Ms Natsuki Kai, a Poraloid photographer, Ms Jean Marie Bellemain, a ceramic artist, Ms Tazuka Izumi and an artist, Mrs Inés P Kuber was held at a salon. All were engaged in heartfelt exchange and enjoyed the warm atomosphere. A wide variety of people from different nationalities joined this event, the venue being within a language school. Many passers-by showed their interests and asked Japonaide staff what this recital was in aid of. We feel we have helped a little towards “Sending a message to Japan” by talking to them. The event, in which the thoughts toward Japan were demonstrated in various ways, succeeded in raising 512 Euros. All proceeds will be donated to the “Home for all” project.